We set off at daybreak the next morning. Everyone in the group felt that sense of excitement that accompanies the start of an expedition. After looking at my GPS I realized why this forest felt different. At 600 meters above sea level we were at a lower elevation than other areas I had surveyed. Many of the forested tracts in central Vietnam are at elevations of 1000 meters or more. This was true lowland tropical forest. According to information gathered from local hunters, this was the ideal habitat for many endemic ungulates, including Saola. After traveling upstream we divided into two teams. I would lead one group along with the head Forest Guard and a local guide. Thien, another WWF biodiversity consultant and my primary collaborator in the field, would lead the second group with two other Forest Guards. Our group headed north. The guides were smiling and chatting in Vietnamese as we walked. I was admiring the beauty of the forest around me and occasionally catching splashes of their conversation. All was good. 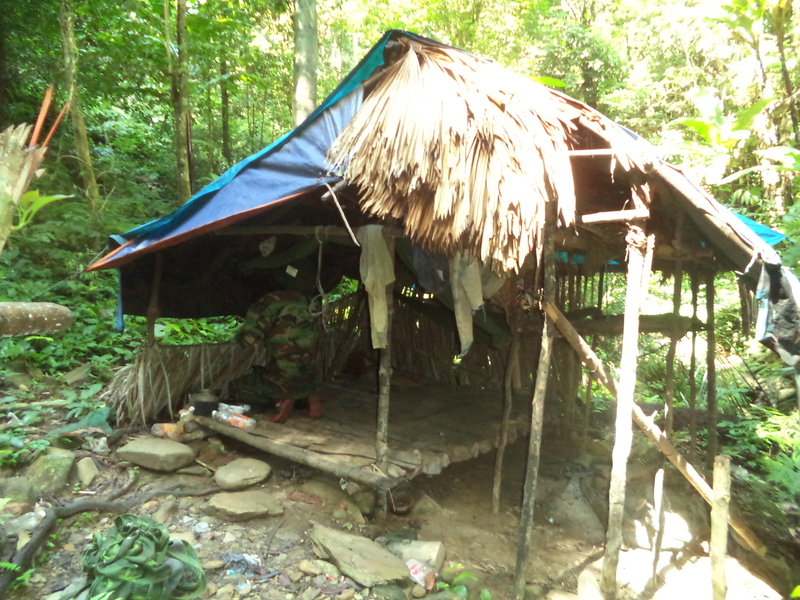 And then we saw it: A bright blue tarp standing in sharp contrast to the green jungle vegetation. It was a poachers camp. We froze. 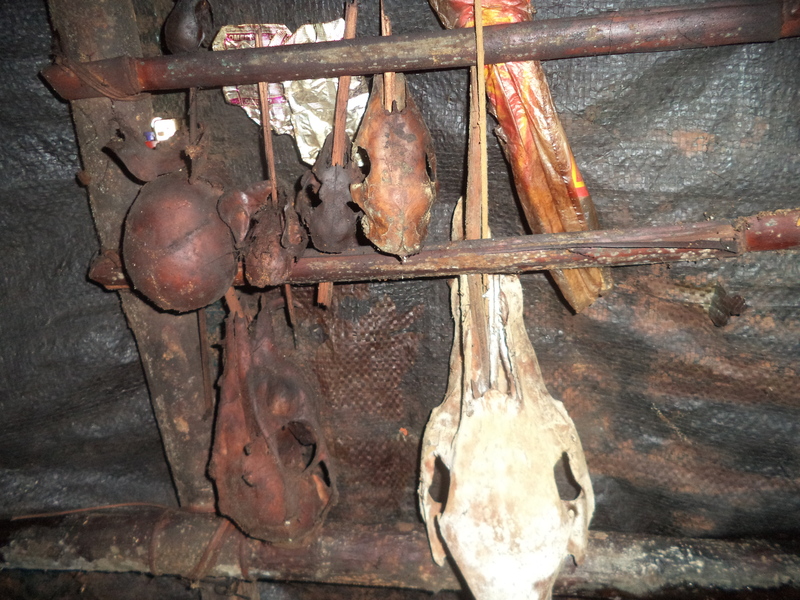 The Forest Guards had already warned me that poachers in this region were often armed and dangerous. I ducked into a tangle of bamboo while the Forest Guard cautiously approached the camp. He crouched low into the vegetation like a tiger stalking its prey. Then he jumped into the campsite, looked around, sighed, and waved us over. It was empty. We walked up to the camp and looked around. Hours-old cigarette butts and still-smoldering ashes told us that we had just missed its inhabitants. Then I noticed a grisly sight: a trophy board along one of the palm-thatched walls. 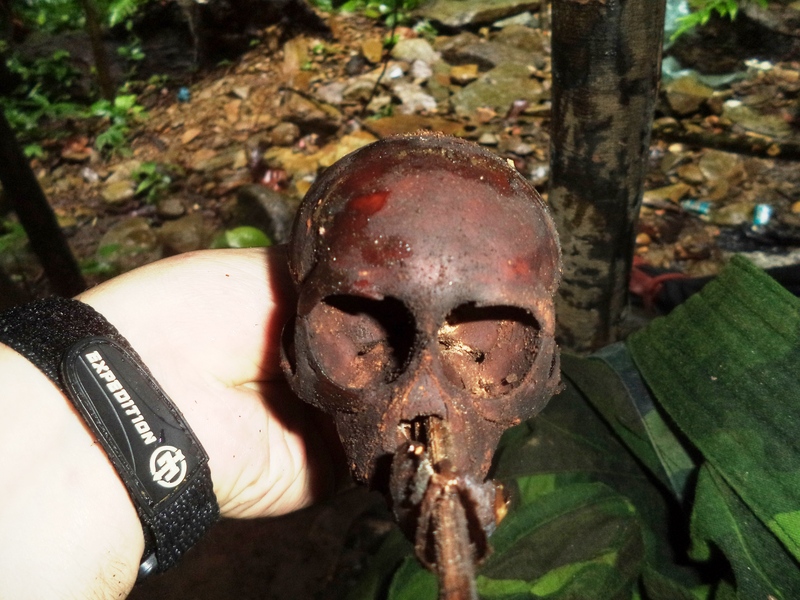 Skulls and feathers provided a macabre reminder of the poachers most recent kills. Although sickened by the sight, I tried to put my emotions aside and act as any professional zoologist should. This was, after all, data. I examined each skull. Pig, muntjac, and monkey were all present, along with a host of small carnivore species. All seemed to have been killed weeks or even days before. It was a depressing reminder of ongoing illegal hunting in this area. I tried telling myself that it was also evidence that there were still large mammals present in the area—but it didn’t make me feel much better. We were all silent for a few minutes. I remember thinking: Has this paradise been lost? One of the Forest Guards must have read my mind. “There are still animals here,” he said in a quiet yet firm voice. “This is still a good area. One of the best in Bach Ma.” I nodded and again drifted back into my own thoughts. I decided that I could use this experience one of two ways: I could let it get me down or I could use it to fuel my work. “Let’s go,” I said to the team. We shouldered our backpacks and set off into the jungle. We weren’t as optimistic as we had been half an hour before. But we were more determined.